Here is a list of Filipino festivals, fiestas and local celebrations in the month of April 2014. April 1 | Starts off the Holy Week with the usual metaphorical rendition of Christ’s entry into Jerusalem, with the congregation bringing palm fronds to the church for blessing. They would afterwards bring home the fronds and display them in their altars believing that it will aid in the plea for the forgiveness of sins and will bring blessings from above, keep illnesses away and ward off evil. April 1-3 | The art of ant harvesting is shown in a dance parade around town. “Abuos” is an exotic delicacy of the residents. This event coincides with their town fiesta. April 1- April 5 | A harvest festival that opens on the first day of April, showcasing the different varieties of banana which is abundant in the municipality. April 1- April 9 | Different activities lined up in this celebration that include trade fair, food festival, cultural shows, street dancing, painting contest, beauty pageant and with highlight on the kesongputi, made from carabao milk, fermented and wrapped in banana leaves. April 1-May 1 | A weeklong festivity showcasing the beauty and rich historical/cultural heritage of the town. Featured are cultural presentation, native foods galore, song-writing and logo making contest, nature trekking and many more. April 1- May 31 | Initiated by the City Tourism Office, this activity offers affordable tours around Davao City. April 1- May 31 | The competition is an annual tradition that features the best fireworks suppliers in a contest to out-do each other in presenting supreme-quality pyrotechnics. EK is celebrating 10 years of providing magic and enchantment to the public. As a treat to their patrons, guests to the park will witness at least 4 fireworks presentations for all weekend of April and May. April 1- May 31 | It is a multi-lateral Trade Exposition highlighting 12 renowned provincial festivals: Ati-Atihan of Aklan, Higantes of Angono, Iloilo''s Dinagyang Festival, Lucban's Pahiyas, Davao's Kadayawan, Ilocos Sur's Viva Vigan, Bacolod's Masskara, Zamboanga's Hermosa, Naga's Peñafrancia, Batangas' Parada ng Lechon, Tacloban's Pintados, and Cebu's Sinulog. April 3 | A 5-day celebration culminating in April 3, to commemorate the Independence Day of Luisiana. The whole celebration revolves around the Pandan plant and its by-products like bags, hats, mats and other novelty items. April 4 – 25 | The art work – shops are in dance, music, theatre, visual arts and new media. The Summer Youth Fest features the summer art lectures and workshops that are open to youth, sports clinics for various athletic. April 6-8 | Foundation Day Anniversary Celebration of the province showcasing the rich cultural heritage of the people of the Mt. Province with street dances, theatrical performance, sports competition and agri-tade fair. April 7 | A week-long commemoration of the historic battle of Mactan between the Spanish Conquistador Fernando Magallanes and Mactan Chieftain Lapu-Lapu. April 7 | A gathering of all highland tribes in honor of Mt. Apo as the country''s highest peak, it comes as no surprise that Mt. Apo is considered sacred ground. Join the highland tribes of Mindanao to the mountain in this annual gathering. April 7-8 | A thanksgiving celebration for a bountiful harvest in the Municipality highlighted by an agri-industrial fair, street dancing, parades, beauty pageant and sports competitions. April 7- April 9 | Paralethics from Visayas and Mindanao will converge in Zamboanga City for a three-day sports competition. Champions in this event will then compete in the 3rd ASEAN Paragames to be held in Manila in December 2005. April 08 | A dinner/cultural show presented by the Asian Gem Tourism Foundation, Inc. in cooperation with DOT and PAGCOR. It is an authentic cultural extravaganza showcasing the rich heritage of Filipino culture, fashion, traditions and festivities through dances, music and songs. April 08 - 12 | A trek to Mt. Hamiguitan where one finds the 600 hectares Bonsai Field or the so called "Pgymy Forest". in western style rodeo events like bull riding and sterr wrestling, apart from our local games like the good old carabao race. So put on them boots and saddle up – its gonna be a rope-slingin’, dust-kickin’, cowpunchibn’ affair. April 9 | The fall of Bataan is commemorated every year. Top government officials, Japanese and American WW II veterans including their Filipino counterparts and visitors go to Mt. Samat to participate at the annual rites held to honor the bravery of the soldiers who fought for the defense of Bataan. April 9-11 | A typical town fiesta celebrated with parades, playground demonstrations and people’s night honoring the culture of the Isinais. Dupax del Sur is also home to the Spanish colonial St. Vincent Ferrer Church and an ecclesiastical museum. April 10-29 | In admiration of the Majestic Mayon’s beauty and splendor, this festival is dubbed as Magayon, a Bikol term which means beautiful. It is a celebration of the Albayano’s way of life and a thanksgiving for the abundance of the land’s plentiful harvest through various activities such as agricultural products display and trade fairs, cooking shows, cultural events, street parades, photo/arts exhibits, sports events, and many more. April 10, 16-18, 27 May 6, 18, 27 | The largest religious activity consists of seven fiestas or lupi to commemorate the seven sorrows of Our Lady of Turumba, starting before the Holy Week and every nine days thereafter and ends in the month of June, celebrated with a dancing procession. April 11 - 16 | A festival depicting the origin and various uses of the pandan plant, showing the town’s agricultural wealth, and products of the barangays. The festival highlights the sweet delicacies, origin and their uses in the collective memory of the people of Mapandan including a cook fest of exotic foods. April 12-14 | Regional groups from all over the country participate in this yearly float and street dancing competition organized by the Manila Broadcasting Company (MBC). It features the various festivals held in the different regions. April 13-16 | As the term suggests, Bantayog festival features the storied First Rizal Monument or “Unang Bantayog ni Dr. Jose Rizal” which is the centerpiece of the celebration. It is held in conjunction with the province foundation anniversary. April 13- April 17 | The Congress aims to foster relationship among cavers in the country and to help develop the knowledge and attitude of the community on the Tourism Industry. The Sierra Madre Outdoor Club and Sang-at Salug Outdoor Club are pioneering outdoor groups in region 02 are collaborating for the event. April 13-16 | ‘Panggayjaya’ is an Isinay word meaning ‘gathering’. The festival celebration is observed with street dancing competition, baratillos, float parade, ground demonstrations participated by all the schools in Bambang. The highlight of the fiesta is the search for Ms. Bambang and an invitation dance held annually. April 13-17 | A roster-full of activities highlighting an agricultural fair that exhibits the town’s bountiful harvests and products. A musical festival, children’s sports competition, cultural events enhance the harvest celebration. April 13 – May 6 | Kids and teens immerse themselves in different arts workshops. Interwoven to these workshops is the global call to take a stand for Mother Earth. Arts serve as a medium for the advocacy for the care, preservation and rehabilitation of the environment. 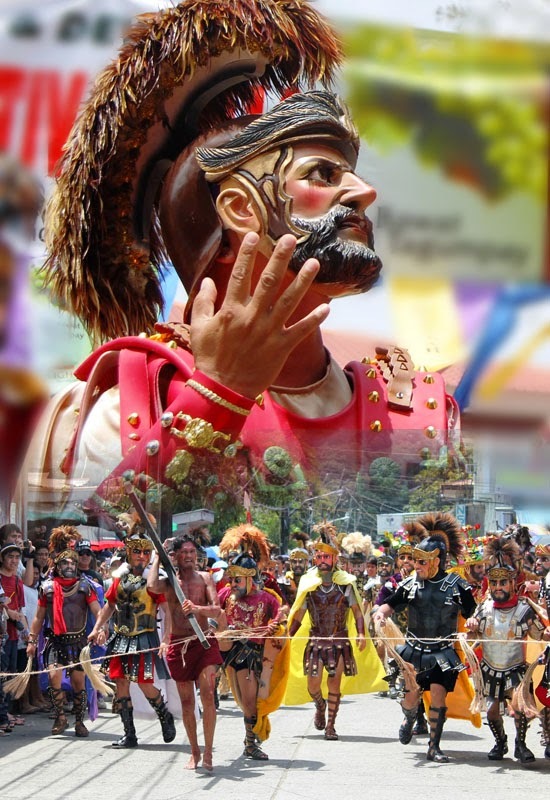 April 14-20 | A festival of the moriones, colorfuly garbed and masked soldiers and centurions; culminates in the reenactment of the beheading of Longinus. The entire towns of Boac, Mogpog and Gasan are virtually converted into huge stages as the story of Longinus unfolds. April 14 | Thanks giving for the bountiful harvest of the sea in line with the municipality’s foundation day and fiesta. April 15-17 | An annual activity held along the shore of Sto. Niño, Sagñay, Camarines Sur, the highlight of which include Bikini Watch, Beach Disco & Ballroom Danciug, Beer Plaza & Concert of the Bands, Beach Sports competition, Float Parade, Street Dancing Competition, among others. April 15-22 | Spread over a weeklong schedule, Manggahan culminates in a grand showcase of all the municipal festivals in a bid to show the world that there is more to Guimaras than its sweet, fiber and pest-free mangoes. Varied activities are being showcased depicting the cultural & historical heritage of the province with emphasis on the promotion of Guimaras as a “mango country”. April 16| Libod sayaw refers to the street dancing around the town center, an original moving pageantry with choreography based on Philippines folk dances. The pristine beauty of the shallow Mantalip Reef is now the subject of the Libod-Sayaw, a mardi gras celebration during the feast of the town patron saint,Vincent Ferrer. April 16 | Initiated by the Aglipayan Church since the seventies. The people gather in the town plaza to hang Judas and burned the effigy done on Black Saturday. In this spectacle, the people are reminded of Judas’ treachery and they all participate in “executing” him. April 17 and 19 Maundy Thursday & Black Saturday | Two (2) days celebration. First day is the station of the cross and the second day s the re-enactment of the life of Jesus. April 16- April 18 | A 3-day annual festivity to commemorate the Earth Day Celebration which features fluvial parade, tree-planting and other environment educational activities. April 16 -19 | A cultural fiesta of the Ifugaos of Hungduan which features ethnic games, rituals, arts and crafts-oriented activities. April 16-20|Coincides with their fiesta in honor of their patron saint, St. Isidore de Farmer. Activities include Ecumenical Service, Street Pageantry, Agro-Industrial Fair, NGO Night, Balikbayan Night, SK Night, Municipal & Barangay Night. April 16-22 | Ka-angkan is the Feast of Clans being celebrated during the Cityhood Anniversary of Marikina. The feast is being celebrated as a tribute to the native residents of the city since they were the ones who formed the community and shaped the city’s own culture and tradition. April 17 | From the traditional taste to the most modern way of rice cake cooked in bamboo using direct firing. April 17 | A parade to give thanks for a good harvest participated by various barangays and establishments in colorful costumes and instead of marching, dance in the street. April 17-18 | Lenten Presentation on the hillside of Jordan with locals as actors. This ala-Oberrammergau Passion Play has been attracting locals and tourists whose visit usually culminates in the trek to “Balaan Bukid”. April 17-18 | Traditional presentation of the passion and death of Christ located in an 11-hectare rolling terrain presented through the larger- than-life size 14 Stations of the Cross at the St. James Parish. The place draws Roman Catholic pilgrims from all over the country yearly. April 17-18 | A unique mixture of solemn religious rites and local celebration in Bantayan Island where friends of the residents and tourists experience the scenic rites and cool off the summer heat in beautiful white sandy beaches. April 17-18 | A week-long observance of Bicolanos unique religiosity and a pilgrimage to "Amang Hinulid" Amang Hinulid, as popularly called by his devotees and beneficiaries, is an image of the Lord Jesus in repose in his tomb. Thousands of pilgrims coming from far flung localities would flock in Barangay Sta. Salud in Calabanga town only to plant kiss to the image. To fulfill a promised "pagsongko", one must devote himself into walking a twelve-kilometer road stretch, if he comes from Naga, in the late night of Maundy Thursday or in the early hours of Good Friday. April 17-18 | Passion plays called cenaculo are held in various places all over the Philippines during Holy Week. However in Cainta, Rizal, people take to the streets to witness passion plays participated in by the town folks. April 17-18 | Traditional presentation of the passion and death of Christ which starts at the foot of Dariok Hill and ends at the top where the Chapel of Transfiguration is located to accommodate parishioners and Roman Catholic pilgrims. A long procession from the city starts every Good Friday morning and ends at Dariok Hill for the Stations of the Cross. April 17-18 | An impressive array of centuries old religious images owned by Don Escudero. These images are borne by their silver carrozas as an expression of faith of the citizens of San Pablo. April 17-18 |Holy Week An annual feast of indigenous tribes in Magpet celebrating a bountiful harvest. April 17-18 | Experience spiritual cleansing through sacrifices, i.e. religious rites (reenactment Passion of Jesus) at St. James the Greater Church, procession alongside life-size images of saints on carriages on selected city streets. April 17-18 | A mountain climbing/trekking activity and via cruces participated in by the Catholic community of Zamboanga del Norte and the neighboring municipalities. April 17-18 Holy Week | A religious activity during holy week. The center of this celebration is the chapel on Ermita Hill where the “Penetencia” is held. People from other parts of the province come to join this celebration. April 17-18 | A live reenactment of the 14 Stations of the Cross along the main thoroughfares of the city. April 17-18 | A yearly depiction of the crucifixion of Jesus Christ. April 17-18 | Lenten presentation depicting the judgment, crucifixion, death and resurrection of Jesus Christ. April 17-18 | A Kapiya or tableau of the 14 Stations of the Cross is set-up in strategic places all over the town where the procession would pass through. This tableau would either be composed of human characters or art works. On Good Friday, people would go around the town to witness the judging of the most unique and beautiful Kapiya along with the most authentic Pasyon (Passions of Christ) Singing. April 17-18 | A time when herbalists from all over Visayas and Mindanao participate in a ritual known as "Tang-Alap". April 17-19 | A group of men, after feasting and doing an overnight meditation, gather around the church to await the Santo Entierro, a wooden statue of the dead Christ. They rush forward to insert various objects in the folds of the robes, under the feet, in the hallow of the hands. The image is then loaded with handkerchiefs, bronze medals and pieces of paper inscribed with Latin phrases. The float is encircled by the men with linked hands. After the procession, these men retrieve the objects from the image, then followed by the ritual called Subok, the testing of the talisman by using whips, revolvers, knives, machetes and bolo throughout the afternoon and evening until Holy Saturday. Each one tests the effectiveness of his talisman by requesting another man to shoot or stab him. April 17-20 | Highlights of activities fall on Holy Thursday, Good Friday, Black Saturday and Easter Sunday. The Christian Community Theater in coordination with the Silay City Government presents contemporized and stylized version of the sacrifices, death and resurrection of Jesus Christ. Good Friday procession of the images of Saints made in Italy and crafted by the local artists attract believers and tourists alike. April 17-20 | A way of repentance and sharing in the sufferings of Christ, worshippers whip themselves or have themselves crucified at Kapitagan, Paombong during the Holy Week. Also, religious rituals are celebrated in all the towns especially in Malolos, Plaridel and Pulilan. Old life-size "Santos" are brought out to be part of the colorful processions on Maundy Thursday and Good Friday. On Easter Sunday, a little wooden angel (or a live little girl) descends from the Galilee to take of the virgin's mourning veil. April 17- May 4| Features street dancing, bangus grill, deboning, day & night variety shows, trade fairs, beauty contest, sports fest, cook fest, medical mission, visual arts, band concerts, dogs show, fluvial parade, drum & lyre parade and street party. April 18 Good Friday | In a tiny village called Lourdes, northwest of Angeles City, people are kept busy during Good Friday when some five to ten penitents perform their annual vow of penitence by having themselves nailed to the cross in a makeshift Golgotha. The commemoration starts at about 1:00pm with the reenactment of the arrest of Christ in the Garden of Gethsamani and the dramatization of Christ's passion and death is played through the streets up to the Calvary where the actual crucifixion takes place before 3:00 in the afternoon. April 18 | Held every Holy Wednesday and Good Friday. The “Prosisyon ng mga Santo”, Baliuag's main Lenten attraction is a grand parade of 60 lavishly decorated floats depicting scenes of the passion and sufferings of Christ. April 18| Live re-enactment of the 7 last words held on Good Friday at the Hills of Bgy. La Granja. The Kalbaryo, being a community based and multi-sectoral theatrical showcase makes a total distinction in translating the promise of Christ’s most liberating resurrection. April 18 | Highlighted in every Good Friday at a hilltop of Ermita hill “Pagpapako” celebration. Simultaneous at poblacion procession of different patron saints. April 18 | A re-enacment of Christ's passion and death is done every GoodFriday. The re-enacment is complete with a passion play andculminates with the actual nailing of at least three penitents on wooden crosses atop a makeshift Calvary. In Leyte, Holy Week sacrifice and meditation (pamalandong) are best expressed in Palo where Jesus Christ’s sufferings on the Cross are re-enacted. A town fiesta with baratillos, parade and people’s night and parlor games for the locals. Kasibu is the Citrus Capital of the region producing different varieties of oranges. The event is celebrated with parades, fun rides for adults and children, playground demonstrations and people’s night highlighting the rich and colorful Bugkalot culture. A premier summer festivity dedicated to the beautiful presence of Manta Rays in the locality. Pasa Pasa is the Bicol dialect for the manta ray (manta birostris) considered one of the five (5) largest species of fish in the world and now an endangered pelagic. April 19 (BLACK SATURDAY) | A time when herbalists from all over Visayas and Mindanao go to San Antonio, Siquijor to participate in a ritual known as “Tang-Alap”. They roam the area’s forests, caves and cemeteries to gather medicinal herbs and roots, after which they sit in a circle and combine the ingredients in piles. The gathering culminates in an exclusive ritual that takes place in a secluded cave at dawn. April 19 | Tarlac City commemorates its cityhood anniversary with series of cultural sports and other events. One of the highlights is the Abe Abe Quing Dalan, a street party with local and national bands performing. April 19-20 | Black Saturday is highlighted by 3-hour presentation of “Vigilia na Muling Pagkabuhay” at the patio of the church. On Easter Sunday, a celebration is held of the reunion of the Risen Christ with Virgin Mary is reenacted. It is facilitated by young girl inside an inverted giant paper flower suspended the removal of the mourning veil from Mary’s head by a from bamboo trellis. The petals are mechanically opened by giant toy birds to reveal the girl inside. It is then followed by a religious dancing of young ladies called “Kapitana” and “Tenyenta”, to the tune of “Bati”. April 20 | Showcases the “Sugat” in which the town is known for many years. Street dancing depicts the joys felt by the believers when Christ resurrected. The celebration is followed by long games and entertainment that highlights the endownment of Minglanilla’s history, trade and arts. April 20-29 | The La Laguna Festival is a week-long celebration that highlights the biodiversity of the lake and the rich natural resources of Laguna. It showcases a variety of competitions such as the dragon boat race, brass band competition, flora and fauna farms, cookfest, trade fair and the choreographed sound and sight fireworks competition. Organized by the Provincial Government in cooperation with the Municipal and City Mayors of Laguna. April 20 | The Holy Week is capped with a float parade and homecoming activities to highlight the rich history of Carigara, which was once the capital of Leyte. April 20 | The Easter festivity unfolds at dawn around five o’clock with a procession heralding the resurrection of Christ and his reunion with Mary. While the molded images of Mother and Son are placed side by side, a little girl dressed up like an angel replace the Blessed Virgin’s black veil of grief and mourning with a white one as the Osana, a hymn of praise and adoration endemic to Parañaque, is sung. April 20 | A grand parade of “ caromata” carabao drawn carts full of farm products and colorful decors.Agro fair/cultural shows. April 20 | Is celebrated every Easter Sunday and ends with a streetdancing on the seventh day after Easter. Haladaya means "Halad kang Datu Daya", the leader of the first Malayan settlers in Daan Bantayan. April 20 | A religious procession that depicts the meeting of the resurrected Jesus Christ and His mother, the Blessed Virgin Mary. It is usually celebrated every dawn of Easter Sunday. April 20-25 |Beauty pageant, street dances and trade fair of coconut and bamboo products which abound in Isabela, characterize this festival. April 20-27 | A festival promoting San Carlos City as major trading center of bamboo based products/furniture and best producer of "carabao" mangoes and other mango variety in the country. April 21 | Traditional celebration of reading “pasyon” that depicts the life and death of Jesus Christ. April 21 | A boat-rowing race on the waters of scenic Pinacanauan River. April 21 (3rd Saturday) | Barangays Bagong Ilog and Sumilang share one patron saint – Sta.Rosa de Lima. This is a miraculous image found by two fishermen from Bagong Ilog & Sumilang. The image is fetched by the celebrating barangay from other barangay. They have a very colorful procession for the Sunduan. April 21-22 | A stage presentation / re-enactment of the Savior’s arrest, trial and painful way to Calvary, crucifixion and death on the cross. There are also real-life depictions – penitents cause themselves to be crucified – punishments borne to express sorrow for sin, to make up for a wrongdoing and obtain pardon. April 21-22 | A yearly trek of devotees coming from the neighboring municipalities, cities and provinces in Visayas and Mindanao to Camiguin’s walkway considered the Region’s famous Holy Week site As a holy week event, Panaad means to walk around the Island of Camiguin for a promise. The 64-km-walk serves as a test as to how much one will endure to keep a promise. To keep the essence of the Holy Week, the 14 Stations of the Cross serve as the guide of the whole walk and are posted throughout the island starting in Benoni, Mahinog, just around 300 meters from the wharf. Because a participant has to walk around Camiguin, the Panaad event is also referred to as “round” by the locals. April 21-22 | The Holy week celebration, particularly Good Friday, is a display of devoutness and traditional pomp. The Good Friday procession is the highlight of the Semana Santa, a devotion manifesting the fervor and faith of Agoo folks. About 30 “carozas” beautifully adorned, line up at the Plaza dela Virgen, a remarkable tradition dating from the Spanish times. There is also a Penitential Procession of Women all dressed in black, in honor of the Mother of Christ. April 21- April 24 | Ethnic thanksgiving with cultural fair by Ifugaos in Hingyon. April 21- April 27 | Reviving the barter trade between the Mait native and the Chinese traders. This weeklong festivity features agro-trade, historical parade, re-enactment of the barter trading and Indakan sa Sanduguan (a street dancing competition). April 22 | Sponsored by Legend International Resorts, Inc. and coinciding with the annual Earth Day celebration, the Subic Bay Legendary Wilderness Adventure brings together adventure seekers, travel enthusiasts and sports-minded people all over the country to compete against one another in several adrenalin-packed activities involving mountain biking, kayaking, mountain survival skills, tree rappelling and mountain trekking. The event is meant to promote awareness and preservation of Subic's natural wonders by holding sports and adventure competitions. April 22- April 23 | "Hinugyaw" a local dialect that means rejoice/revelry is celebrated every 25th to 30th of April every year. The six day festivities will culminate on April 30 with a grand parade in the afternoon featuring street dancing performers in their colorful costumes. April 22-26 | Formerly SANIKLDAD festival, objective is to safeguard the ecological beauty from destruction & renew the vows of the community to replenish the environment. Highlights are parade of cultural dances, trade & tourism fair, beauty contest, balikbayan night, coco food fest, sports fest, matinee shows, water sports, and goodwill games. April 22-28 | A one-week celebration of the festivity wherein one of the major activities is the "Streetdancing". April 23- April 26 | A tree-planting activity done at the foot of Mt. Apo and clean-up program at the peak. April 24 | This is a proud tradition where beautiful maidens compete for attention with the gaily-decorated Karosas with their load of goodies. April 24-30 (last week) | Sibit Sibit is derived from an ancient term called "small paddle banca" used for fishing, as the city was born from being one of the ancient fishing villages of the country. Highlights of the event are banca races, fluvial parade and sail show, beach volleyball, bankang buhangin sculpting competition, bingo bonanza, summer dance craze, among others. April 24- April 30 | Yagyag is the vernacular for spawning, to lay eggs or spread, propagate and grow. The process refers in particular to the crabs and other marine creatures that gather during the months of October to December in Sapa, one of two springs found in Barangay Cangmating of Sibulan. APRIL 24-30 | An ecotourism festival that heighten environmental awareness, promotion of understanding and conservation of environment, and observing wildlife. April 24-May 1 | Thanksgiving Festival for the year’s bountiful harvest from the sea, celebrated every 1st of May. Various activities are lined up such as the selection of the “Limgas na Pangasinan”, drum & lyre competition, trade & tourism fair, dance sport/orchestra contest, concerts, variety shows, youth/family camps & sports fest. April 25 | Street Dancing parade. April 25 | Description According to an old story, the early settlers of Pinamalayan came from Marinduque. While on their way to Mindoro using their boats, they encountered turbulent weather and lost their direction. They prayed to God Almighty for deliverance and guidance so the weather cleared and a rainbow appeared on the horizon. The crew shouted ipinamalay meaning “it was made known”. They followed the direction of the rainbow and landed at what is now Barangay Lumangbayan and established the first settlement which they named Pinamalayan. The rainbow became the historical landmark of the town. The yearly Bahaghari Festival is a colorful commemoration of the importance of the rainbow in the history of the town of Pinamalayan. The celebration includes a street dancing competition, cultural presentations, religious and cultural activities, products and trade fair. Like the rainbow which rises to give color in the sky after the torrent of rain, the Bahaghari Festival is a reflection of the continuing effort of the people of Pinalamayan that there is truly paradise at the end of the rainbow. April 25 | Held every Sunday nearest the first of May or Labor Day. It is a harvest thanksgiving celebration by the people of La Carlota City. The festival is based on an age-old practice of offering thanksgiving to the god of agriculture living inside Kanlaon Volcano. April 25 | This is a tribute to fishermen of Estancia. It is a celebration that calls for ultimate cooperation and soul of "Bayanihan" among their neighboring town. April 25 | An annual celebration commemorating the province''s founding anniversary when it formally declared independence fro its mother province of Capiz on April 25, 1958. April 25-26 | Celebrates the founding anniversary of this Malaueg town with the traditional cooking of ‘Sinabalu’, cooking of glutinous rice with coconut cream on bamboos and roasted in open fire in the town square. The Malaueg culture is showcased in songs, dances and presentation of Biaug and Malana, a local epic. Rizal is also home to an old Spanish colonial Church and has become a favorite summer retreat among Spanish authorities. April 25- April 29 | Exhibit of different products mainly from Sabutan. April 25-29 | Ethnic Sports Festival and thanksgiving rites featuring Ifugao''s traditional practices showcased in their songs, dances, arts & crafts. April 25-30 | Highlight of the festival is a mardi gras. Featured are kickboxing, field demo, bingo bonanza, beauty contest, musical extravaganzas and activities for senior citizens. April 25-May 1 | The festival symbolizes the spirit of unity as what the name connotes in the Ilokano dialect. The festival is highlighted with street dancing competition, beauty contest and trade fair exhibits. April 25-May 1 | The festival symbolizes the spirit of unity as what the name connotes in the Ilokano dialect. The festival is highlighted with the conduct of streetdancing competition, beauty contest and trade fair exhibits and selling. April 26 | This is a thanksgiving event for a bountiful harvest, with festivities like street dancing competition and agri-trade fair. April 26-27 | Festival that will showcase the copper mines, Mine Pit, buildings and large machineries which was operational until it’s temporary closure in 2001. Sponsored by Cabarrus Catholic College Alumni Foundation International (CCCAFI) founded in USA and organized by former and current residents of San Jose, Sipalay and supported by local government in San Jose, Sipalay, Negros Occ. April 26 - May 1 | A colorful event that highlights the parade of floats featuring the agricultural and industrial products of Liliw, a parade of bird mascots reminding the people of the origin of the name “Liliw”. Katutubong Palaro, Gabi ng Harana, musical arts and painting contests and the Gawad Parangal for outstanding Liliweños for their exemplary service to the community are among the highlight activities of the festival. April 27-29 | Provincial level festival commemorating the first Malayan settlement in Malandog, Hamtic and the beginning of the Malayan Civilzation in the Philippines. April 27-30| Conducted every last week of April as a tribute to mother nature through tree growing and cleanup activities, and the Mt. Apo Boulder Face Challenge. April 27- April 30 | Festival incorporating the exhibition of the cultural heritage of Mindoro’s ethnic communities. April 27 - May 1 | A summer festival to commemorate the Foundation Anniversary and Feast Day of St. Joseph the Worker. Various colorful activities are featured to boost local tourism. April 28 | Pantabangan boasts as one of the biggest fish producing area in Asia. Fishing industry is the primary means of livelihood here. "Pandaw" means ensuring that there will be fresh water catch each time you fish in the lake. April 28 | Festival incorporating the exhibition of the cultural heritage of Mindoro’s ethnic communities. April 28-30 | The event highlights the “Dikit” or glutinous rice and its by-products namely bibingka, muriecos, inangit, tupig, kalamay and tinudok, among others. All farmers in Aurora plant this glutinous rice served to guests during special occasions. April 28-May 5 | A festival which users the “Butanding” (whaleshark) season and a thanksgiving for its blessings to the people of Donsol. The festival is highlighted by a street parade. April 29-May 1 |A fluvial parade followed by various entertainments. The coastal barangays grill fish early in the morning and take it along the beach for all to partake. of Our Lady of Peace and Good Voyage, popularly known as the Virgin of Antipolo. The image, which is already three centuries-old, is said to exhibit supernatural powers. To this day, many families visit the shrine and at the same time organize picnic activities in the cold hills of Antipolo. In the evening of April 30 to the eve of May 1, thousands of devotees from several places in Metro Manila make annual trek on the foot to Antipolo. April 30 | Kalipayan in the native tongue of the people of San Agustin means “festivity” or “merry making”. It is being held every last Saturday of April to promote and highlight the cultural and eco tourism sites of the municipality. April 30 | The patronal fiesta of Bambang is also celebrated with simple activities like novena masses and processions. April 30-May 2 | The event provides the mood and reason to celebrate. It features activities like band contest, street dancing and sports activities from different barangays and a cook fest highlighting the ‘Mungo’. April (movable) | Camote Festival is a two (2) day celebration, the first day is the cooking competition with camote as an ingredient, and the second day is the search for Bb. Castillejos. April (no definite date) | Kinulob Festival gives recognition to the local native chicken raisers. Kinulob is one way of cooking the whole chicken with unique presentation. Street dance competition, mini band exhibition, cultural presentation and Mutya ng Mabini pageant are some of the highlights of the festival. April (No definite date) | Description It is a ten-day showcase of flower garden and ornamental plants selected by the Los Baños Orchid Society. April (no definite date) | A week-long celebration coincided with the foundation day of the Municipality which falls always on every 15th day of November of every year and highlighted by duck floats, duck recipes, series of games of duck activities and duck sayawan (street dancing) wherein the costumes/attire are hasped on the duck materials. April (Fullmoon) | A weeklong event that gathers artists and art aficionados from all over the country. Various art workshops, film showing and exhibits are the highlights of the festival. May 1 | SuMaKaH is an acronym for Suman, Mangga, Kasuy and Hamaka, the icons that make Antipolo a must-see destination during May time aside from the pilgrimage. It is a month long celebration with activities such as : Grand Opening Parade and Street Dancing Exhibition every May 1.